Preamplifiers is a special group among the audio systems. Most difficult to design properly and mostly underrated. 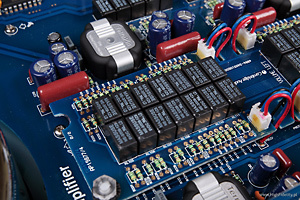 It all starts with the fact, that this preamplifier does not have to amplify anything, but mute – a CD player with a 2V output is able to drive almost any power amplifier to high levels of sound. This is best visualized by a passive preamplifier, where there are no active components at all, but only a damper (except the case of a passive preamp based on autoformers). But lead everything right in an active device, amplifying elements are necessary, working in input and output buffers – adjusting impedance – and as the true amplifying elements. Preamplifiers are available in an endless number of versions, depending on what they are fitted with – starting with the most simple ones, having only one RCA input and output to complicated ‘centers’, with the prominent examples being the devices of the American McIntosh and the Japanese Accuphase’a. There you find all necessary inputs and outputs, regulations, expansion capability, etc. But for every element to be on a high level of quality, those have to be made well. And this means – yes, yes, you guessed it – lots of cash. 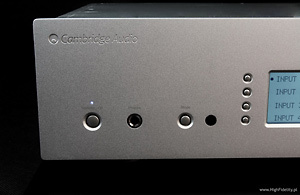 The coming of the preamplifier Azur 840E from Cambridge Audio is not a peculiar thing, because this is a logical step in the evolution of the company. 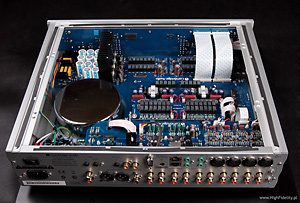 Based on the fantastic integrated amplifier 840A (tested together with the CD 840C for “Audio”; test 840C for „High Fidelity” HERE) a preamplifier 840E and the power amplifier 840W were prepared. And, like I said, this would not be peculiar, if not for their price, especially regarding the preamplifier: costing less than 4000zl it was so rich equipped, that it matches the masters called upon earlier, and was constructed in a very refined way. Its heart is based on precise resistors switched by relays. It is assumed, that the damper accounts for 80% of the units sound (Sic! – see Chris Thomas, Strong Persuader… The Ayre KX-R Pre-amplifier, „Hi-Fi Plus”, Issue 62, s. 50), so in more expensive products this is dealt with in different ways. The newest wave of innovation was created by Accuphase with their AAVA-II (Accuphase Analog Vari-Gain Amplifier), that works in a different way than a classic resistor damper operating in the voltage domain. In AAVA the signal level change is made in the current domain. The signal is converted to a current type one, then it is controlled in sixteen current regulators (giving 65536 possible combinations) and then converted back to a voltage signal. This allows to be independent from the input and output impedances, that change with every setting of the potentiometer and eliminates noise and wearing-off effects of the components. A similar circuit, called VGT (Variable Gain Transimpedance) is used in the top preamplifier KX-R from Ayre. Both those dampers are extremely expensive – Accuphase claims, that the cost of the AAVA-II is about 30% of the cost of the whole preamplifier. And this means a few thousand zlotys, the same amount that is to pay for the WHOLE CA preamplifier. This means one thing, the need to find a different solution. The easy way would be to use a good Alps potentiometer or integrated resistor ladders. And in both cases splendid results can be achieved, as shown by the Luxman L-509u (potentiometer) or the preamplifiers integrated in Ancient Audio players - Lektor Grand SE and Lektor Prime. But you cannot sit on your laurels, and the Cambridge Audio added value to their work and prepared something, that was regarded as the top of refinement, and even now is in the top of classic regulations together with the integrated ladders – a ladder of discrete resistors, switched by means of relays, so that in the sound path there are always only two resistors – one in series and one in parallel (a classic voltage divider). Even more – in the 840E the bass and treble controls are made the same way, this is endemic for this model – I have never seen such consequence in my life. · Doris Drew, Delightful, Mode Records/Muzak, MZCS-1123, CD. · e.s.t. Viaticum. Platinum Edition, ACT Music + Vision, ACT 6001-2, 2 x CD. · e.s.t., „Leucocyte”, ACT Music + Vision, ACT 9018-2, CD. · Maria Peszek, Miasto mania, Kayax Production, KAYAX007, CD. · The Beatles, Revolver, Parlophone/Toshiba-EMI, TOCP-51124, CD. · Pearl Jam, Binaural, Epic/Sony Music Entertainment, 494590 2, CD. · Nils Landgren, Sentimental Journey, ACT Music + Vision, ACT 9802-2, SACD/CD. · Jun Fukamachi, Jun Fukamachi at Steinway, EMI Music Japan/Lasting Impression Music, LIM DXD 038, silver-CD. · Miles Davis, „Kind Of Blue”, Columbia/Legacy, COL 480410, SBM CD. · Tomasz Stanko Quartet, “Lontano”, ECM, 1980, CD. · Bogdan Hołownia, „Chwile”, CD-R made from master tape · Illinois Jacquet, “The Kid And The Brute”, CLEF Records/Verve 557 096-2, CD. · Anja Garbarek, “Briefly Shaking”, EMI, 8608022, CCD. This device is hard to compare with anything else ad hoc. There are not many preamplifiers in the given price category, and even if there are, those are mostly a “filler” than a full fledged offering. The only device, that does not fit in the schematics, and that I know well, is the passive preamplifier Audiomatus PP03. Its price is laughable in comparison to what it offered. But the problem of passive preamplifiers is clear and unambiguous: they work fine with only a part of other devices, and their possibilities to be the “center” of a system are quite modest. On this background, the 840E is like a guest from another reality, able to cooperate with everything we can think of. And it is – I believe it is – a balanced device, what increases its attractiveness. This all should compensate for the fourfold difference in price between it and the Audiomatus. And the comparison of those two devices is worthwhile from a learning perspective, as it is hard to find two devices that differ so much from each other. PP03 is a master (remembering how much it costs) of neutrality and transparency. A full spectrum of dynamics and contrasts and clean timbre. And Cambridge is a master of “saturating” of empty spaces, which – nevertheless – were left untouched by the Audiomatus. And it is about a certain fluency between the sounds, something that in hi-end (I think about the category, and not the devices that are truly hi-end) is natural, but in lower price ranges must be fought for. It would be easiest to tell, that the CA sounds like a tube device. But this is not the case. It sounds completely different from my Leben RS-30CX. It was closer to the C-2810 preamplifier from Accuphase. But the passive Audiomatus pushes it to the ‘tubey’ grounds. Why? Because the 840E plays with the middle of the sound spectrum. This can be heard best when we use headphones, but even if we listen with a power amplifier and loudspeakers its character is unambiguous and undisputed. Differently to the tube amplifiers, oriented to thick, syrupy midrange, the CA preamplifier sounds in a more open, not so colored way. In fact it is hard to speak about coloring – its timbre is the direct result of the withdrawal of a part of the treble, softening of the attack (this is the most prominent thing) and softer, not so strongly accented bass. That leaves a stronger midrange – very even and thorough, but being midrange. As one could expect, all vocals will sound very well. Both Doris Drew from Delightful, as Maria Peszek from Miasto mania sounded in a full, strong way. But none of those voices was not warmed. The slight hoarseness of Maria Peszek, kept by the recording, and a tad exposed by my Harpia, was audible with the Cambridge, it was not softened. Reimyo CAT-777 could handle even that, and although it did not warm anything, it reproduced the voice of Maria in an incredible way, without the harshness, but with full information. CA is far behind, similar to its price, so it can’t handle everything. 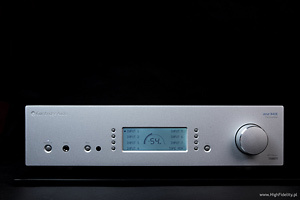 But comparing it to other preamplifiers from the 10000zl range, like the Majik Linn, one cannot underestimate the coherent and holistic way in what Azur handles musical matter. It does not chop anything, does not create not-existing worlds, does not underline anything. Its sins, about them in a moment, are more in things lacking, that on surplus. The tonal balance is shifted to the midrange, with a slight preference of its higher part, in the vicinity of 1kHz. 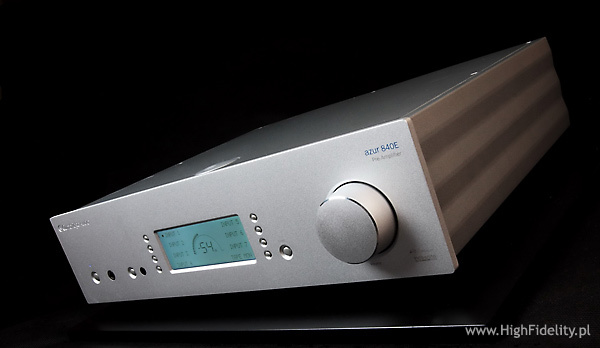 I am not sure if the 840E is a balanced device, because it looks like that from, still Andrzej Kisiel from “Audio” visiting the factory, asked exactly that question and was told, that the preamplifier is not balanced. Anyway, if we have a balanced system, the preamplifier sounds better using the balanced inputs and outputs. Its usage is very pleasant, and the connection capabilities almost infinite. Taking all this into account, including the splendid – for the given money – sound, it would be hard not to recommend it. So: a warm recommendation. It is long ago, when I had at my home such a complete and competent constructed preamplifier, that would be so user friendly in every day usage. This can be attributed to a very well-thought placement of the buttons. In the center – verbatim and metaphoric – is a milky-white, big LCD display, the same as in the integrated 840A. It shows the names of the inputs, attributed to the buttons visible next to it. In the middle there is a volume display – alphanumeric (from infinity to 0dB) and in the form of a bar graph. Simple and splendid. The display presents also the chosen work mode – ‘Direct’ or with treble and bass controls. The last one can be triggered by pressing the ‘mode’ button. A separate button is used to activate the mode with the shortened sound path. And besides that there is only a big jack headphones socket and a ‘Stand-by’ button. And of course a big, handy volume control knob. Its cut, shiny edges suggest a Chinese origin, but this is the only thing, that can lead to the place of manufacture. Moving it we will hear slight clicks. This is a sign, that the damper, based on resistors and relays with gold plated pins. The back plate is densely fitted with sockets. There is only no gramophone input, and this because CA offers splendid, external RIAA preamplifiers. We get seven line inputs, not balanced, based on RCA sockets, with the two first ones doubled by XLRs (hot=2). We choose between RCA and XLR by means of a small switch, placed near the sockets. There is also a separate tape input. 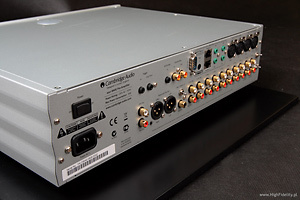 A plethora of outputs is also available – we can send the signal for recording, there are two such outputs – and a mono signal for a subwoofer (mono). The last one can be a full-range one (both channels are summed) or with the upper frequencies cut at 200Hz – we can choose the appropriate mode by another switch. Next to those there are also volume controlled outputs – one balanced XLR and one not balanced RCA. Besides audio connectors we have also sockets for communication in multi-room systems – triggers, RS232 (Crestron) and a set of Incognito connectors. The latter is a proprietary CA system, that allows for low-cost multi-room or remote controlling. There is of course also a IEC socket with a mechanical power switch. The inside looks splendid. The RCA inputs (not gold plated) were soldered into the main PCB and are switched by relays. The signal from there goes to the shielded and mechanically damped TerraPin modules (with ten pins), which initially amplify the signal. The modules are a clear homage to the HDAM modules from Marantz (which resigned from their usage) and similar circuits from NAD. It seems, that those are surface mounted. Behind those the PCB with the damper is visible, located above the main PCB on elastic distances. It is beautiful – resistors and relays. The circuits seems to be fully balanced – each channel has the signal led by three wires to and from it (plus, minus and ground). Also the rest of the circuit looks balanced. But how this is in reality – I do not know. Like I wrote earlier, the factory informed it is not. But inside it looks differently… Behind the damper we have another TerraPin module (buffer, driver). Near the front panel we see the treble and bass adjustment circuits, also those are based on resistors and relays. 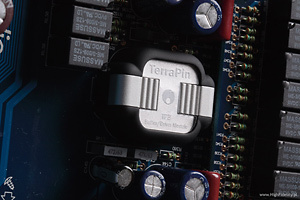 The balanced inputs and control circuits are on a separate PCB. Behind the XLRs we have ICs – the NE5532. So if the signal is de-symmetrized somewhere, it must happen there. Only, that the signal from that PCB goes to the input selector is also sent in the symmetric version – for every socket we have three wires. It seems, that the separate headphone amplifier is also made on the NE5532 chips and output based on transistors in push-pull setting. 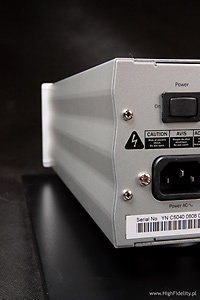 The power supply is especially well designed, with a big, shielded toroidal transformer and many filtering capacitors. It seems, that every channel has its own secondary windings, and what this implies, its own power supply and control circuits.